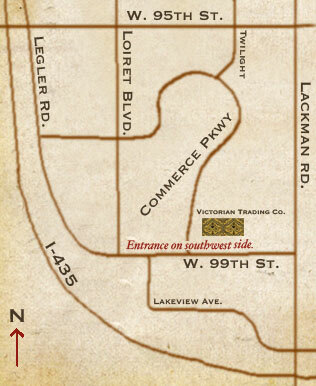 Locations | Victorian Trading Co.
We invite you to visit our Catalog Outlet Store in Lenexa, Kansas, where everything is 30-80% off our catalog price. This treasure trove of one-of-a-kinds and fresh finds is filled with romantic clothing and accessories, elegant home decor, seasonal gifts, and garden items. But do pay mind: our openings take place the first weekend of each month from 10:00am - 5:00pm. See below for store hours or call 844-724-2329 to make an appointment. Conveniently located off I-435 in the Kansas Commerce Center, 15614 West 99th Street, Lenexa, Kansas 66219. Click here to view our location and street view on google maps. Follow Our Outlet Store On Facebook for special store events!